I recently discovered a new favourite cheap Thai lunch option near my work. 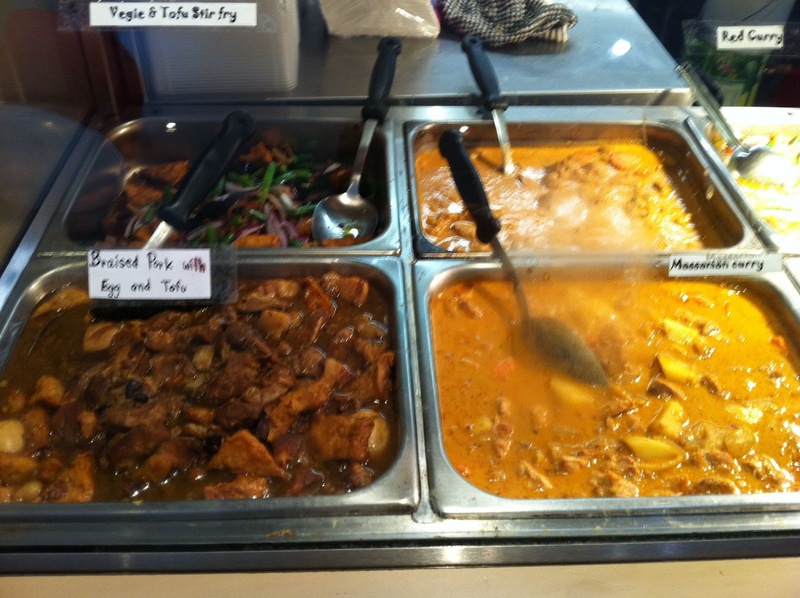 Cheap, Thai and nearby = win, win and win! 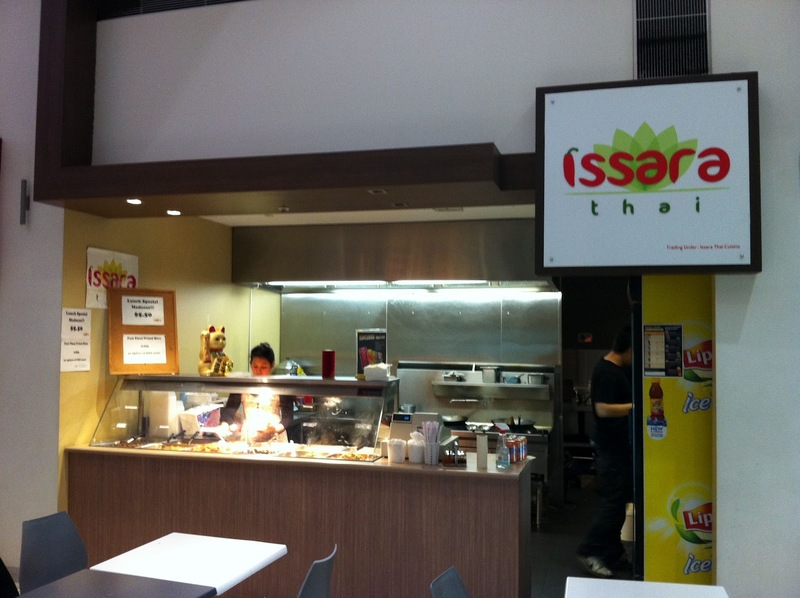 Issara Thai is in the foodcourt underneath the Cambridge International College building at 422 Little Collins Street. I mentioned this unusual little foodcourt in my recent post about Little Collins Espresso's wonderful Vietnamese iced milk coffee. Read about it here. Issara Thai is the latest player to occupy this spot in the foodcout, it was previously Nusantara's second city store then another Thai restaurant then Issara who originally opened with a set menu style offering served up in Japanese style compartment takeaway containers with delicate little egg nets on each meal. 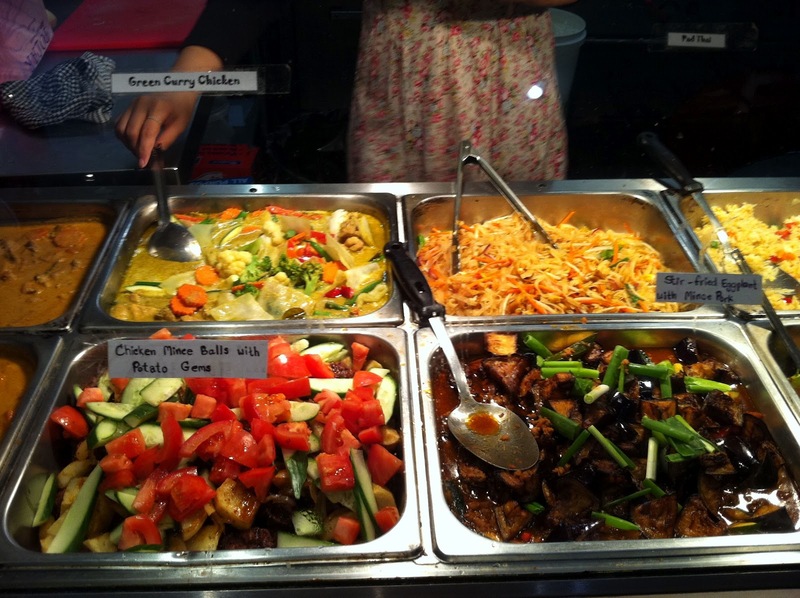 It was a cute offering but obviously not the best fit for the local lunchers as they have changed things up to now offer a bain marie with the choice of fried rice or vegetarian Pad Thai with a choice of extra dishes. 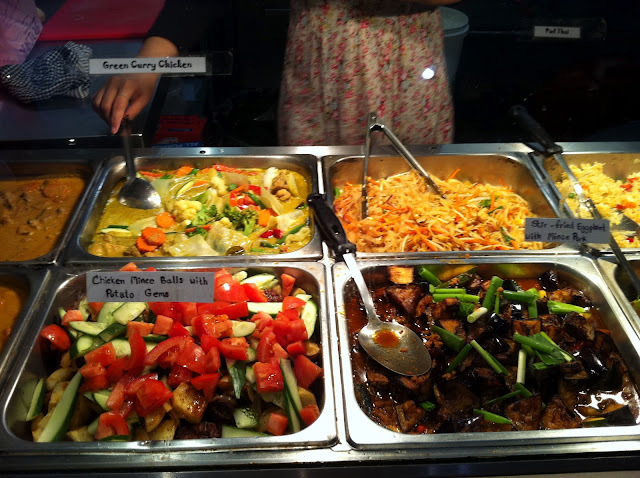 Fried rice or Pad Thai with one extra dish is a bargain $5.50 or $7 for two extra dishes, also a bargain! I have been a regular since they changed to the new offering and have slowly worked my way through most of their meals, all of which I have found to be exceptional. Issara offer the usual green chicken curry, red beef curry and massaman curry but what excites me more is the less common offerings of stir fried eggplant with minced pork, braised pork with tofu and boiled eggs and chicken mince balls with potato gems. Also great is the stir fried beef with chilli jam (nahm prik pao) and veggie and tofu stir fry. Early on in my adventures with Thai food I often discounted many dishes as not authentic Thai because they used ingredients like potato but I now believe that potato is actually used quite often in Thai cooking (other than Mussaman curry of course). The chicken mince balls with potato gems is one of these dishes. I love this dish, which I think is more of a Bangkok street food meal rather than a traditional Thai classic. Lately, I've developed a bit of a theory that Bangkok street food vendors can sometimes be very progressive with the meals they offer and are constantly coming up with new combinations of traditional flavours combined with what many would consider more western vegetables. I'm not sure where I'm going with this other than to say that its best to keep an open mind and not write dishes off as untraditional too quickly. Just because a dish seems to have western influences doesn't mean you won't see it served up on Bangkok's streets and I don't mean Khao San Road. What I'm saying in a round about kind of way is that the Thai seem to have a way of taking elements of western and other cultures and blending them relatively seamlessly into their own modern culture. 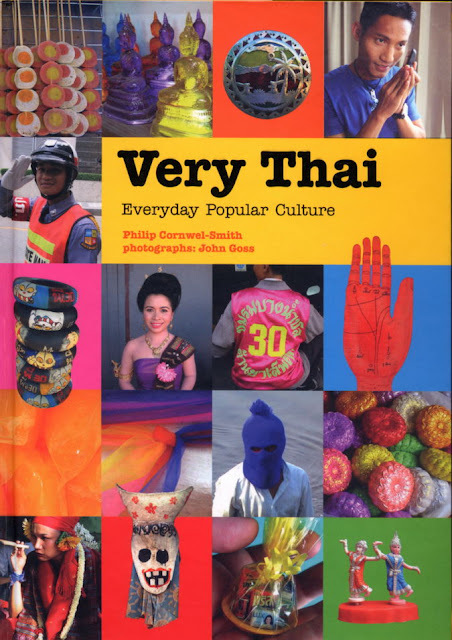 A good example of this is the updated version of the wai traditional Thai greeting while holding a mobile phone from the excellent book on popular Thai culture 'Very Thai' (top right hand corner). Now that I've said that, one thing I'm still a bit undecided about is Issara's use of tiny cubes of carrot in their fried rice. Don't get me wrong, their fried rice is simple but excellent. I think my issue with carrot in fried rice is just a bit of a hangup from the Chinese Aussie version of fried rice (sometimes with peas too!) offered in the 'all you can pile on a plastic plate' shopping centre buffets. I'm pretty sure you won't find carrot in the fried rice (Khao Pad) that you buy in Thailand, except perhaps if you're in Phuket! Maybe some things are sacrosanct and not to be played with, in my theory Khao Pad falls into this category. Another Issara favourite of mine is the stir fried eggplant with minced pork. I have only recently discovered my love of eggplant, I went crazy for it when I first tried Cinnamon's Sri Lankan eatery's superb version of egg plant curry. Issara's eggplant offering is also excellent, beautiful smoky creamy eggplant combined with a lovely seasoned pork mince mix. It's not something I've seen on any other Thai menu which makes it even more appealing to me. Is it authentic? See my theory above. Aside from being great value for money and having such an interesting variety of meals, one of my favourite things about Issara is their use of heaps of fresh vegetables. 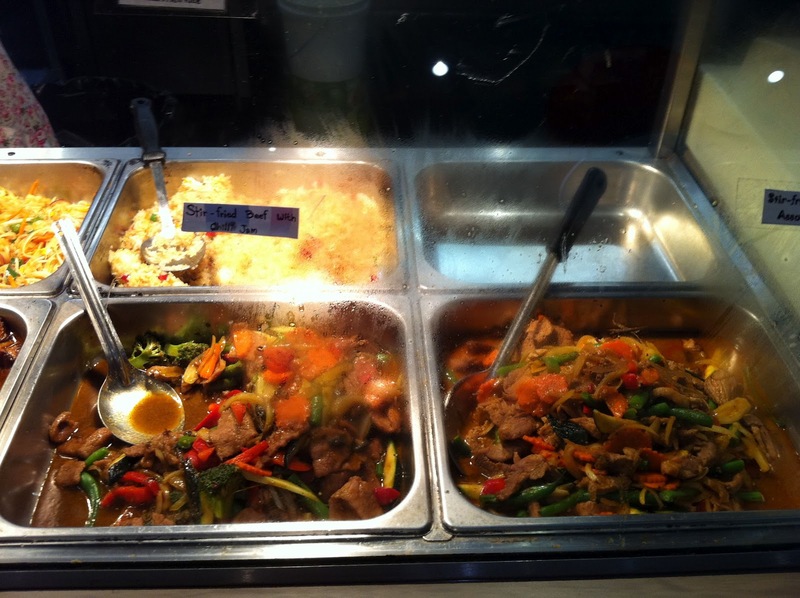 Great exponents of this are the stir fried pork, the stir fried beef with chilli jam and the veggie and tofu stir fry. The green chicken curry is another great example, the use of broccoli, cauliflower, carrot, cabbage and capsicum is again perhaps not what you would traditionally expect but the flavour and heat of green curry was spot on for me and the vegetables add a wonderful crunchy freshness to the whole meal. If you could't already tell, I'm a huge fan of Issara Thai. I love having somewhere that sells fresh cheap Thai food so close to my work. I reckon I probably eat there (or get take away) 2 or 3 times a week. They are easily the best business to occupy this shop in the foodcourt and I'm very hopeful that they'll outlast all the other previous occupants.